From Spyderco's affordable BYRD line. The BY22 byrd folder has a Hawkbill-shaped blade. This distinctive curved cutting tool’s claw-like tip overwhelms material in its cutting path. As the hook pulls what is being cut against and in contact with the sharpened edge, the hook winds around material stopping it from sliding off the tip. The Hawkbill blade’s shape is rooted in the commercial fishing industry, its profile ideal for downward, sweeping cutting performed at arm’s length directed away from the body. Full serrations across the blade’s length measurably increase its cutting capacity for separating webbing, cardboard and coarse or fibrous material. The hollow-ground blade features jimping at both spine and choil for additional tactile dexterity and control over the cutting edge. 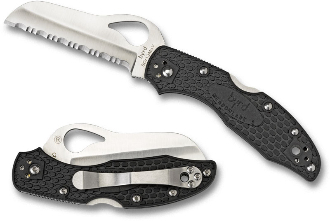 Its black fiberglass handle is Bi-Directionally Textured® for slip-resistance in any hand position with an ambidextrous tip/up, tip/down steel pocket clip. Nested inside the handle are full length skeletonized steel liners, increasing rigidity and strength without adding bulk or weight. Screw-together handle construction allows for adjustment and a lanyard hole located at the handle’s edge accommodates secondary retention through attachment of a lanyard or thong.